Patriarchy started on off planet on Nibiru, hundreds of thousands of years ago. We must take it upon ourselves to form some sort of sacred partnership with the gender of our choice to put an end to this brand of patriarchy that deems women to be second class citizens. 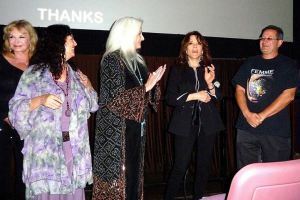 The inspiring new award winning, feature length documentary film, entitled FEMME: Women Healing the World, directed by Emmanuel Itier and executive produced by Sharon Stone, has recently opened in both Los Angeles and New York City. Coast to coast, audiences are giving it a standing ovation and leave the theatre brimming with excitement. FEMME features over 100 women from all over the world sharing their views on how women will be the driving force to heal our troubled world. We see and hear in FEMME from global female leaders, Nobel Laureate’s, former Prime Ministers, actresses, musicians, teachers and women from all walks of life from all over the world.